During Meier’s Great Journey through the Universe described in Contact Reports 31, 32, 34 and 35, he allegedly traveled to many different galaxies, stars and planets. A system he also visited is the TARO system in the galaxy MARA, 15,000 million light years from Earth. During this visit together with Semjase he saw an alien spaceship which Semjase tried to contact. 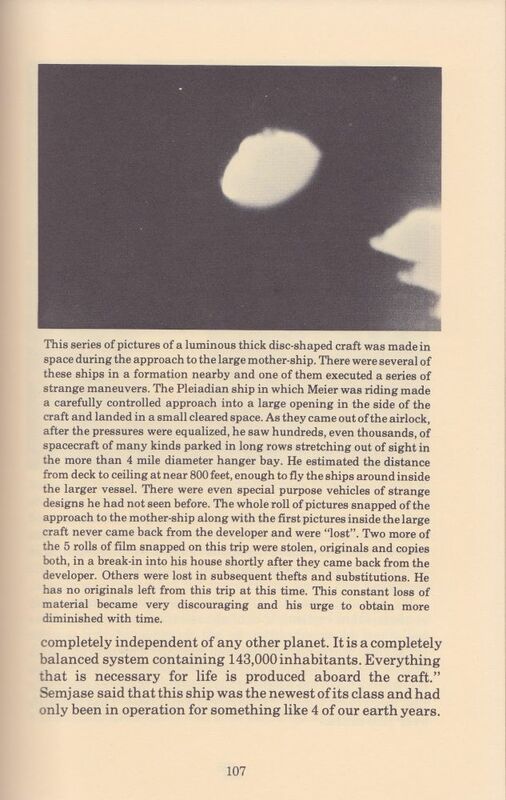 Along with this passage two pictures are published of which it is not entirely clear what they are supposed to represent, whether they are of an alien spaceship as is discussed on the same page of the contact report or two totally different objects. 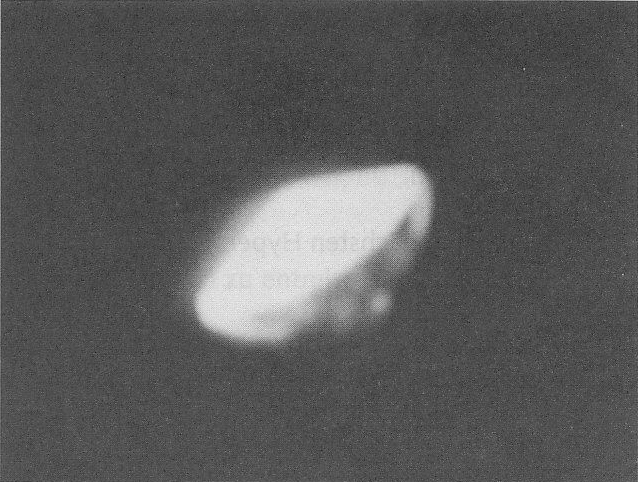 These pictures are supposedly part of the collection of 42 space photos of which around 2001 it ‘was strictly ensured, with the help of Ptaah, that it only concerned “Billy’s” genuine pictures or his pictures that were only slightly falsified’. 478. Now come, because we want to go down to this world. 639. What you see there in front is a star cluster of the galaxy MARA. 640. It is the system TARO and 15,000 million light years away from your home. 641. Most of the worlds of this system are blue in colour, which you can confirm later, when you fly there with Semjase. 642. These worlds are still alive with volcanic activity, and only in a few million years life will begin to develop on them, if at all. What’s that down there, Semjase? It seems to me to be a flying object. Are there inhabited worlds somewhere around here? 479. Certainly, it is a flying machine. 480. However its origin is foreign to me. 481. I will try to get in contact with it. Didn’t you get in contact? 482. My attempts are unsuccessful. 483. It must be life forms who maintain no intergalactic communication. Aha – but in what language did you speak? This is something I’ve never heard before and it appeared to me absolutely foreign! 484. You couldn’t know that. 485. It is a pronounceable sign language. I don’t understand that. I thought a sign language could only be drawn or painted or written by certain movements etc. 486. That is not true, because sign languages can also actually be spoken. 487. To explain that to you would take a lot of time. Then we leave it at that. Along with this passage, the below two pictures with very little detail are published, showing two unrecognizable objects, or perhaps one and the same object from different perspectives. From the context it seems this is supposed to be the ship Semjase was trying to get in contact with. 71. Now look there to the front, there is our great-spacer which will take us aboard. For some reason the description between the square brackets regarding the photographing of the Plejaren beamships near the Great Spacer is missing in UET-WS and also in the 2nd and 3rd edition FIGU contact notes (German). Since we don’t have the original German 1st edition contact notes, we cannot confirm whether this description is present in there or not. 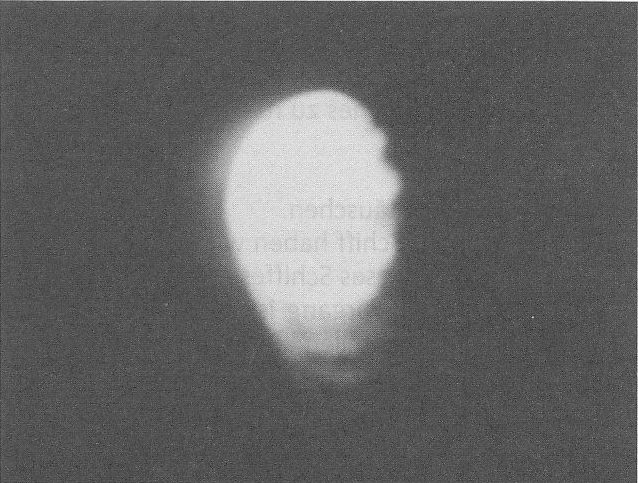 In the first color picture, two or three white shapes are visible to the right, which in the context of the description in MFTP Vol 1 could represent the ‘luminous lens-shaped ships‘. The ship near the center of the picture would be the ship performing a ‘strange summersaulting maneuver.‘ As mentioned above, for some reason the picture in PPKB 1 is cropped so the ‘ships’ on the right aren’t in the picture anymore, and the text only mentions one ship in the TARO system. As opposed to a lot of Meier’s other outer space picture these pictures do not have a long history of criticism and counter arguments. 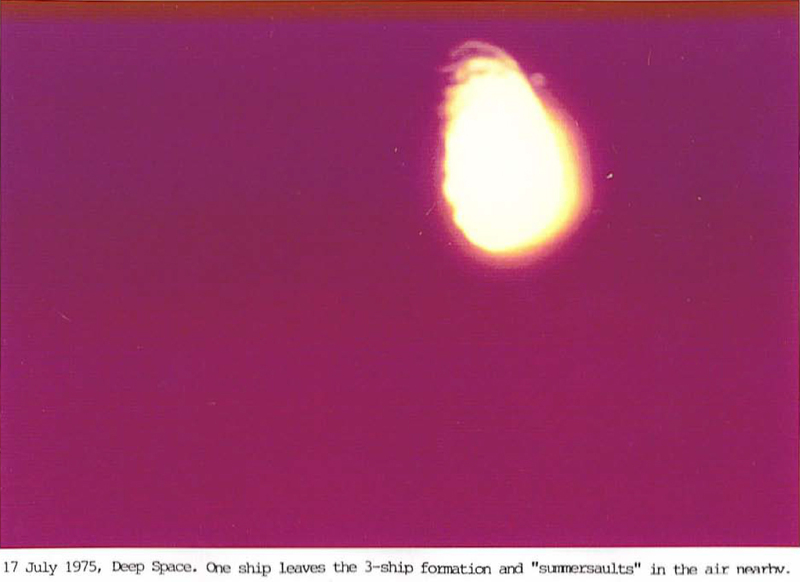 Yet again, at least the first picture originate from a NASA public relations compilation video uploaded by NASA Langley CRGIS (Cultural Resources Geographic Information System) channel. This video is about the Viking program which consisted of two unmanned space probes to Mars, Viking 1 (launched August 20, 1975) and Viking 2 (launched September 9, 1975). These craft consisted of an orbiter designed to photograph the surface of Mars from orbit and a lander designed to study the planet from the surface. Apparently the film was exposed to 3 frames of the video. Note that the trailing particles of the Viking lander and the little ‘extension’ at the top of the lander are also visible in Meier’s picture. 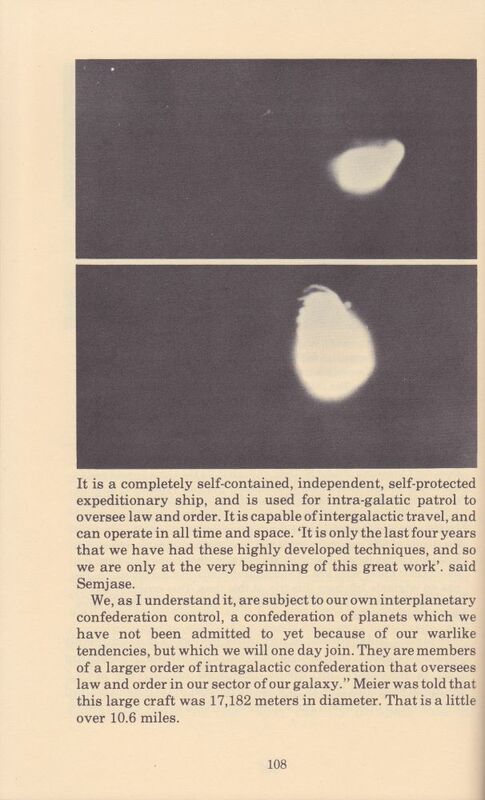 Also notice the star that is near to the top-right corner in both images; the other sharp-looking dots in Meier’s picture are most likely dust particles that were present during film processing or later copying/scanning processes. For some reason the other stars that are visible in the TV frame aren’t visible in the Meier’s picture, maybe because of the poor quality of the picture that could be due to improper film processing or copying/scanning processes, even some editing (intended or unintended) may have been done, either in a later generation versions or in the original. We could not rule out the editing factor because of the obvious fact that in the recent PPKB picture we see no stars at all and the contours of the “spaceship” are relatively sharp and are noticeable compared to Wendelle’s version which is overexposed. Also the other “spaceships” towards the right edge in the picture have been cropped out and the overall image area was also reduced compared to the Wendelle Steven’s version. As mentioned the compilation video comprises of three different video clips reporting the research and developments of the Viking program; apparently each one was separately broadcast in the years 1972 (Viking), 1975 (Viking to Mars) and 1976 (Viking speed towards Mars) respectively. The frames similar to Meier’s picture come from the 2nd clip with the title – Viking to Mars – that was broadcast in 1975. To be specific, based on the information in the video, it must have been broadcast anywhere between March and August, 1975. Based on our previous research and findings regarding Meier’s other outer space pictures it is quite likely that this video was broadcasted well before Meier’s alleged space journey from July 17-22, and/or the publication date of his space pictures (weeks or months later). We have not (yet) been able to find any frames similar to the other two pictures (the third picture is not in the official FIGU literature anymore). Very little detail is visible on these pictures, but it is not inconceivable that these could be based on original or distorted images from similar videos or illustrations showing celestial phenomena (asteroids, small moons etc.) or they could be from totally different sources showing ordinary terrestrial objects (man-made or natural) or phenomena. We have considered three pictures that are supposed to be representing ET crafts, although they are published alongside different passages in Plejadisch-plejarische Kontaktberichte Block 1 (2002) and Message from the Pleiades, 1st ed. Vol. 1 (1988). 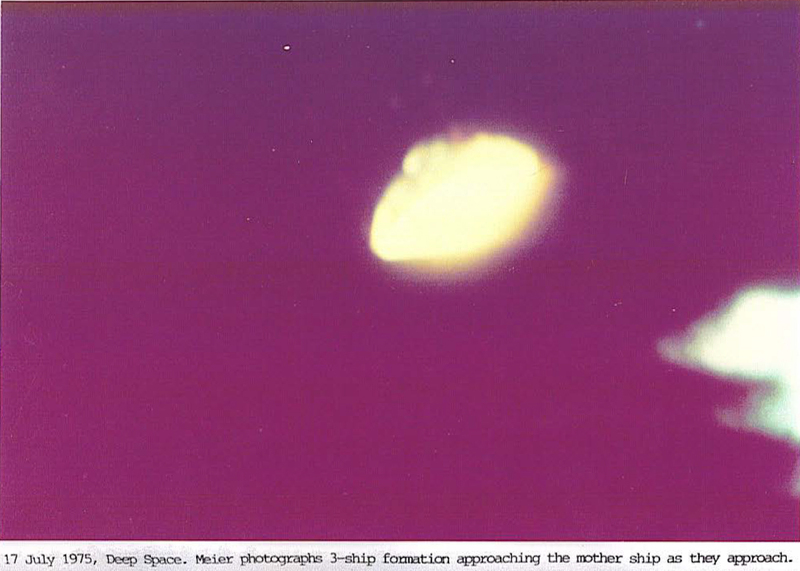 Two out of these three pictures are part of the collection of 42 space photos – of which around 2001 it ‘was strictly ensured, with the help of Ptaah, that it only concerned “Billy’s” genuine pictures or his pictures that were only slightly falsified’. 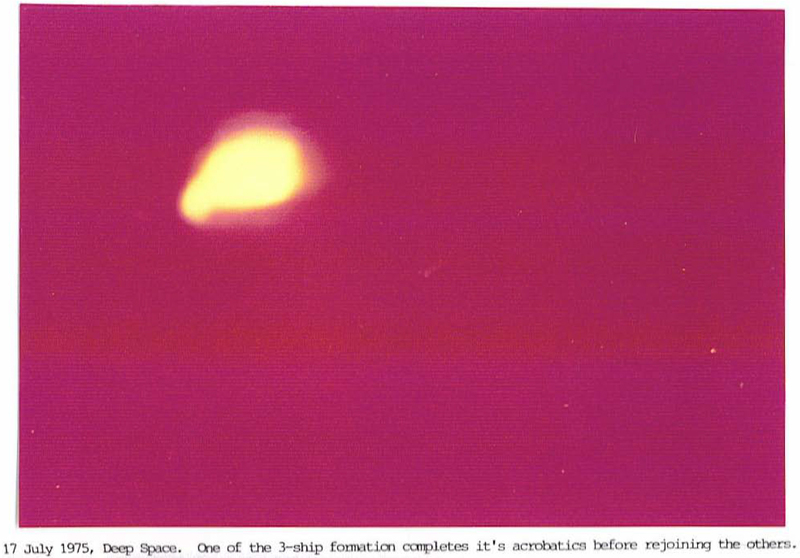 As it turns out one picture is found to be from a NASA video from early-mid 1975 about the Viking program, consisting of two unmanned probes to Mars (Viking 1 & 2), which consisted of an orbiter and a lander . The frames similar to Meier’s picture actually showed an animation of a Viking lander descending through the Martian atmosphere passing through some clouds. For the other pictures, on which very little detail is visible, we found no similar frames (yet).